In the fall, when Heidi Staggert’s son suffered a concussion playing football and needed follow-up medical care during the school day at St. Stephen School in Anoka, she entrusted him to a group of volunteers with great credentials. Her now eighth-grade son has recovered from his injury, and Staggert, an administrative assistant at the pre-K–8 school, is confident in the team of 20 doctors, nurses and other health professionals who have stepped up to fill the school’s paid health paraprofessional hours lost to budget cuts in recent years. 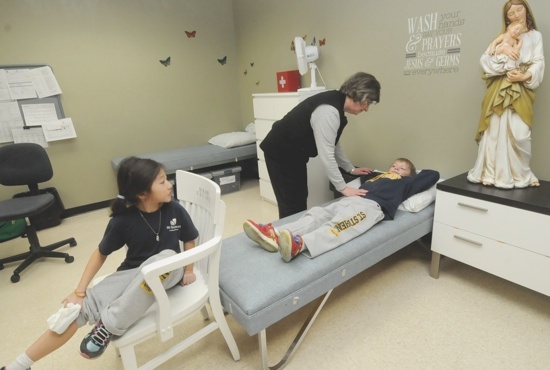 The volunteer health care professionals, who are mostly St. Stephen parishioners and Anoka community members, cover the portions of school days not staffed by Merry Joy Naeher-Olson, a registered nurse who is paid for nine hours per week. The volunteers, some of them retired, bring to St. Stephen many years of experience and a love of children that is reciprocated, according to Rebecca Gustafson, principal of the school, which has 460 students. The need for volunteers arose three years ago when funding for the full-time health paraprofessional position was cut to part time and then in subsequent years to nine hours per week. A health care paraprofessional is not necessarily licensed in a health care profession, but is qualified to care for kids and keep records of their care, Gustafson said. Then-St. Stephen pastor Father Michael Van Sloun suggested calling for volunteers in the parish bulletin and from the Anoka community. Now staffing three- to four-hour shifts are retired and working registered nurses, licensed practical nurses, trauma nurses, a doctor and other health care professionals, Gustafson said. Before they volunteer, all undergo background checks, the archdiocesan VIRTUS safe environment training, and sign codes of conduct to work with children, Gustafson said. Gretchen Anderson, a St. Stephen parishioner who learned of the need through the parish bulletin last year, volunteers three days a month at the school. A retired advanced practice RN and current adjunct faculty member at Bethel University, Anderson enjoys working with the students. The health care team is one of several volunteer groups at the school, and they’ve made a difference, Gustafson said. As a nurse and a mom, Anderson said she believes schools need health paraprofessionals because teachers don’t always have time to help children needing medical attention. “You’re kind of looking at the whole child, evaluating are they physically sick or having heart ache. Because kids do have heartaches. … Sometimes you do see kids who are experiencing a lot of stress. Sometimes it’s because things are going on in their family. They will tell you about stuff that’s going on in their family, and then you just sit and let them talk,” she said.